I attempted nail art again. Well, my idea of nail art. I didn't paint Raphael's School of Athens on my nails, so don't get too excited! My nail art skills are limited, but I've become somewhat comfortable with three techniques--glitter gradient, saran wrap nails, and water marble. I did these nails a few days ago, and I really like them. Blue and gold is my favorite color combination too. I used L.A. Girl Disco Brites in Dance Studio as the base. Dance Studio is a deep berry blue. Then I used NYX Girls Gilded Glitter for the gradient. Gilded Glitter is a mix of irregularly shaped small gold glitters. I'm really pleased with this! It's not a perfect glitter gradient, but my blog is Imperfectly Painted, so I don't care. I'm proud of it, and I like when I try something different! I used Nailed It blog's tutorial to achieve this look. I love tutorials like this because they're easy to read and all in one graphic. Have you tried glitter gradient nails before? Blue and gold really looks great together. Never tried this combo before. Looks great! I think this is gorgeous! Gilded Glitter is so awesome. I've only worn it once but I love it. I looooove this Steph! The contrast is stunning! This is a gorgeous mani. I lo-ooo-ove that rich deep blue color and the gold really pops on it. Stunning. I love glitter gradients... so simple but so pretty! I love this colour combination, it's perfectly lovely! And you do water marbles, which in my head are the most formidable form of nail art so I reckon your skills are pretty awesome! Love that blue and the combo is perfect. I have no idea how I wasn't already following you? I stop by frequently I swear! I really like the way this turned out too! Love that blue! Its such a rich color! Great job love! You should try a saran wrap mani. This looks so great! 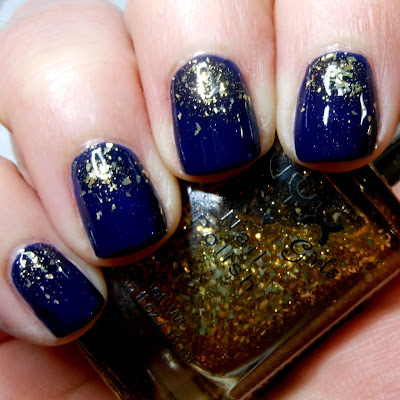 I love the combination of the gold with that dark blue. I think the gradient turned out amazing... nice job =) Also, I agree with KayJay - saran wrap manis are so simple to do and achieve such a great effect!